Get six high-quality effects in one versatile unit. The Mooer Red Truck multi-effects pedal is an all-in-one solution for the professional guitarist on the go. Following diligent research, the designers integrated a combination of six of the most commonly used and desirable effects pedals into one easy-to-use floor unit. The all-analog Boost, Overdrive and distortion circuits provide lush warm tones. A fully comprehensive collection of high-quality digital effects, including Modulations, Delays and Reverbs with Tap tempo control, provide spacious and ambient atmosphere via the stereo outputs. A highly visible and precise tuner will make sure you are always in tune on stage. A built-in parallel effects loop makes it easy to use with your favorite stompboxes or connect to your favorite amplifiers using the 4-cable method. 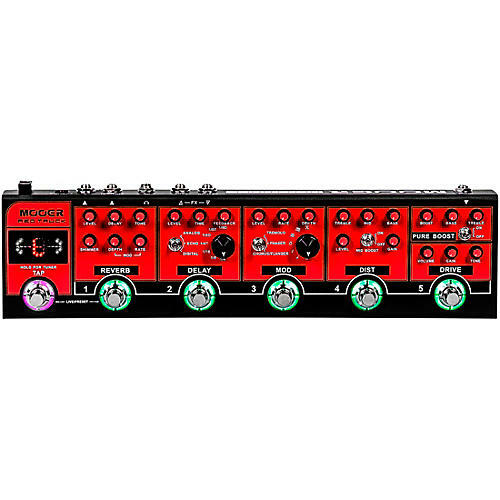 The Red Truck has stereo outputs and a dedicated Mixer output with speaker simulation for direct connection to your favorite mixing board or audio interface. All the parameters and functions are laid out in front of you just like a traditional pedalboard. It's easy to view and adjust on the fly. The Red Truck is compact and easy to transport with the tidy soft-case included in the box. No matter where in the world you are going to play and what you need to connect to, you can always take a fully professional pedal effects rig with you with ease.